And here you see another drawing of Kata from Hungary. It represents 1 of the 10 proverbs of this video. By the end of the lesson, I show you the drawing again. Your task to guess which proverb it is. Let’s start with lesson 13, containing proverbs 121-130. The “doofpot” used to be a type of stove, where you not necessarily needed to burn all the fuel, because the stove could be closed airtight – so the fire would stop burning as no oxygen was supplied. Nowadays, the word has another meaning; we use it to describe a cover-up. So if people, with a certain authority, conceal evidence of wrongdoing. Literally: a nose of wax. The meaning: if you say something is very big, very important; but in fact it appears to be nothing. The expression comes from the theatre in the past, when actors used wax to make their face look different – especially by deforming their nose. I start with the meaning of the expression. “Poolshoogte nemen”, is exploring the situation on the spot. So, to go there and have a look. You can use it to explore the situation in the beginning, but also if you go somewhere to identify the progress of a project. For example, a company is building your house. You go there once in awhile to check the construction phase. Then you can say: “ik ga even poolshoogte nemen”. Ok, now the literal and original meaning. With “poolshoogte” is actually meant the angle of pole star to the horizon. If you know this, you can calculate on which latitude you are. So in the past, this method was used on ships to determine the position. Literally: to unscrew one’s leg. The meaning is to let someone pay too much. Literally: to put the dots on the i. It looks like the English expression: dot the i’s and cross the t’s. But I think there is a slight difference in the meaning. The Dutch expression is used to stress the fact that the major job has been done, and now it is just a matter of the finishing touch. Where as the English expression stress a job to be done with the greatest care and attention for each minor detail. Literally: a rib from my body. You use it to express something is very expensive. The origin is the bible, where God created Eve by taking a rib out of Adam’s body. Although the origin of the saying suggests that it is also worth it, it is not necessarily the matter in the Dutch expression. You can use it when something is expensive and worth it’s high cost, but also when you bought a “kat in de zak” (as explained in lesson 9). Literally: rest rusts. Or: if you rest, you rust. The meaning: if you do nothing, your capacities decline. So, you use it to tell someone he has to stay active. Literally: when there is one sheep over the dam, more will follow. You use this proverb to describe a situation where you are waiting for the first one, and expect that then the others will see that and follow. For example; a nice day, but the terrace of a cafe is empty. People walk by. But once the first customers take place on the terrace, you will see that then much more easily other people also take a seat. It refers to the social behaviour what we in Dutch call: “kuddegedrag”. “Kudde” is a group of animals, for example sheep. “Gedrag” is behaviour. People tend to do something only after they see other people doing it as well. Literally: to go into the ship. The meaning is to loose your money, usually after some risky deal. The origin of this proverb, is that in earlier centuries, it was hard to find a crew for the ships. There were recruiters who went to the pubs, who tried to persuade drunk people to work on the ship, promising a nice future. Of course, it appeared not to be that profitable at all. Literally: to walk next to his shoes. We use this expression to stress someone got conceited and arrogant. Someone who lost a sense of his own reality. The Dutch especially think it is very important – that when someone gets famous he still remains the same normal person. Where in other countries, people admire their hero’s; in the Netherlands it is the opposite. The Dutch admire people who got famous but do like ordinary people. If in a supermarket a famous person stands in the line, no Dutch would ever think of letting him pass because he is famous. A typical sentence in interviews with famous people – is “ik ben gewoon gebleven”. The Dutch society puts so much pressure on this issue that the famous people themselves need to stress again and again that they are normal human beings. Don’t walk next to your shoes. Continue studying because rest rusts. Do not forget to share this video on social media, and to put thumbs up in YouTube. 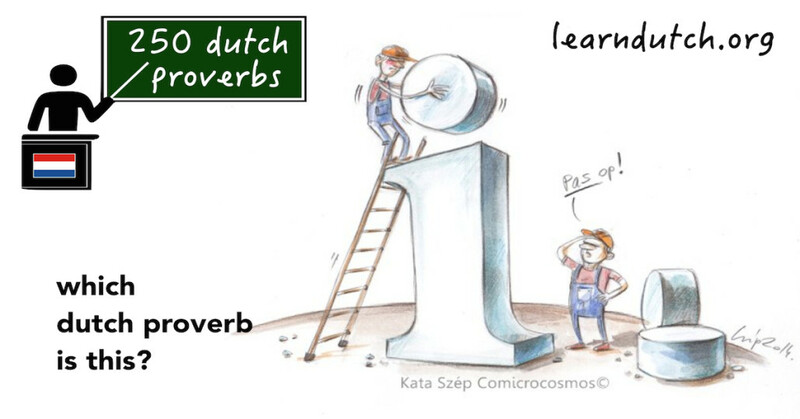 See you back in lesson 14 of 250 Dutch Proverbs.